Aisha Khalid, I Am and I Am Not, 2017. Gouache and gold leaf on wasli paper, 43.5 x 30.7 cm. Zilberman Gallery–Berlin is pleased to announce I AM AND I AM NOT, the first solo show of artist Aisha Khalid in Berlin. The exhibition will take place at Zilberman Gallery–Berlin, at Goethestrasse between April 28 and July 31, 2017. The exhibition I AM AND I AM NOT consists of various paintings, a diptych in book form as well as a site-specific installation. Strongly influenced by the figurative miniature tradition of the Mughal Empire, the Pakistani-born artist Khalid, takes the tradition one step further and contemplates on contemporary issues such as the female figure, or say, the global politics and the uncertainty surrounding us, as apparent in her previous works. Khalid’s radical-yet-subtle criticism represents itself in the use of abstraction. Furthermore, the artist invites us to re-think certain problems from a non-European perspective; what looks out of focus might refer to the precariousness of our era. The renowned motifs of miniatures, such as the Mughal flower tulip of When I Am Silent (2017), are freed from their traditional meanings and become protagonists of contemporary issues. 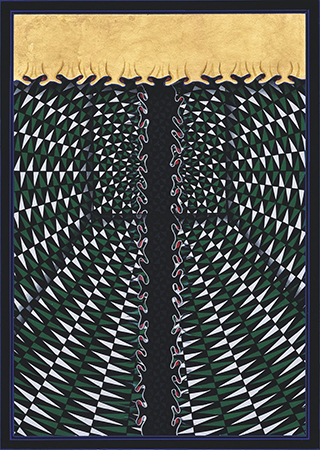 Curvilinear lines reminiscent of curtains—a recurring image in Khalid’s oeuvre—refers to a metaphor of the dichotomy of public and private, the veil or borders. If you look under the hood, something is uncanny in the paintings I Am and I Am Not (2017) or At the Circle’s Centre (2017); the circles might be alluding to, well, bullet holes. Larger than Life (2017), a site-specific installation with video and embroidery, hinges on the problematics of political empowerment and the (im)balance of power. Unfinished hand-made embroidered flowers on the wall, in contrast to the almost violent speed of the embroidery machine in the video, draw attention to the inequality in the society. Aisha Khalid is one of the most prominent contemporary artists from Pakistan, and also works as curator and art educationist. She graduated from National College of Arts, Lahore, in 1997 and received her post-graduate degree at Rijksakademie, Amsterdam, in 2002. She participated in solo and group exhibitions nationally and internationally, including Venice Biennial 2009, Fukuoka Triennale 2001, Sharjah Biennial 2011, Moscow Biennial 2013, and the V&A Museum, the Corvi-Mora Gallery, Asia House (all three in London), Whitworth Art Gallery Manchester, Aga Khan Museum Toronto, the Royal Academy of Art in The Hague and the Modern Art Museum Arnhem, the Netherlands. Aisha was finalist and people’s choice winner of the Jameel Prize 2011, and was awarded the Birgit Skiold Memorial Trust Award of Excellence 2010 and the Alice Award 2012. Her works are exhibited in several museum and private collections all over the world, such as Aga Khan Museum Toronto, M+ Museum Hong Kong, V&A Museum, Fukuoka Asian Art Museum Japan, Sharjah Art Museum, Queensland Art Gallery, Sheikh Zayed Museum, Harris Museum and World Bank. During the opening on April 27, Zilberman Gallery is pleased to host ITINERANT INTERLUDE #14 with performances by Christine Paté (accordion) and Matthias Badczong (clarinet) in a program curated especially for I AM AND I AM NOT. The series ITINERANT INTERLUDES is curated by Laurie Schwartz with the support of the initiative Neue Musik Berlin. I AM AND I AM NOT is accompanied by a catalogue, with a preface by Lotte Laub and texts by Simone Wille, Timo Kaabi-Linke and Atteqa Ali. Press preview will take place on April 27 at 11am at Zilberman Gallery–Berlin. For more information or visuals, pleasecontact goksu [​at​] zilbermangallery.com.